Best Dive Computer Reviews of 2018 - Whats our favorite? Safety should always be a diver’s primary concern and having your own personal dive computer is a fantastic piece of mind. Monitoring all the various information during your adventures under the waves is the ideal way to avoid decompression sickness, and also helps fill your out your dive log efficiently. Dive computers are also a great way to quickly reference you depth and an under water compass on higher end models. Having a sleek dive computer that doubles as a watch is also a great way to proudly identify yourself as a scuba diver on a daily basis. Below we compare some of the most popular and highest rated dive computers on the market. Most serious scuba divers use their own personal dive computer and sometimes even a backup unit. There are quite a few options out there to choose from. This is why we created our dive computer reviews section to help you find one best suited to your needs. Our team only provides dive computer reviews for scuba gear we have had hands on experience with. Whether you are a beginner looking for your first dive computer or a PADI pro looking to upgrade to the latest tech, our dive computer reviews have you covered. We thoroughly test the durability, functionality and easy of use for every review on multiple dives. Choosing the dive computer that is right for you can add a new level of confidence during your dives and allows you to focus on the important part, having fun! Safe diving everyone . If you are looking for a dive watch, check out our new best dive watches of 2018 page! Oceanic dive computers have seen a huge boom in popularity over the last several years, and for good reason. They are a fan favorite when it comes to high end wrist computers, due to their compact design and extremely slick visual aesthetics. Most high end oceanic dive computers look fantastic as daily wrist watches and their sturdy designs tend to be some of the best in class. These models tend to be higher on the price scale and most feature deluxe features such as wireless air transmitters or digital compasses. Many dive masters choose oceanic as their brand of choice and those diving on a regular basis have come to appreciate their reliability and full feature set. Being the Rolls Royce of scuba diving computers does come with a higher price tag however so they may not be as attractive to beginners looking for their first computer. They also offer some top tier computers designed for Air/Nitrox/Trimix which makes them an ideal choice for Tec divers. The Oceanic OCi is hands down one of the best “all in one” dive computers on the market. 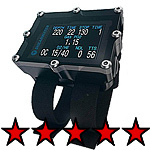 A fusion between the elite level OC1 and the best selling OCS, this rugged wrist computer is perfect for serious divers. With wireless air integration, a digital compass and all the main features of the OC1, this high end dive computer is great for anyone diving on a regular basis. 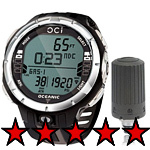 Read our full Oceanic OCi Review. The Oceanic Atom 3.1 is an awesome high end dive computer for intermediate to advanced scuba divers. It supports air and up to 3 programmable Nitrox mixes and has wireless air integration. Of course coming from Oceanic it looks amazing and is packed with features but won’t break the bank unlike its OC1 older brother. Fantastic value for experienced divers. Read our full Oceanic Atom 3.1 review. The Oceanic geo 2 is a fantastic mid level dive computer. It supports air and up to 2 programmable Nitrox mixes. Like most Oceanic wrist computers it is compact and sleek enough to work as a daily watch, and all the information is nicely laid out. While it lacks a digital compass or wireless air transmitter unlike some of the other high end oceanic models, it is a great intermediate level dive computer. 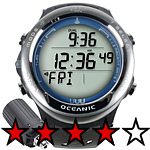 Read our full Oceanic Geo 2 review. Suunto dive computers are a synonymous with long lasting reliability. A name familiar to anyone who has been diving for a long time. The brand has been around for ages and their rock solid reliability has lead to many people having the same computer for almost 10 years without the need for a replacement. 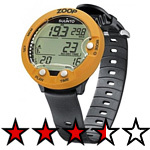 They make excellent entry to mid level dive computers such as the suunto zoop, with its iconic large bezel to the D4i which has the looks of a slick sports watch. A Suunto dive computer tends to have a very rugged, sporty appearance in VS the more elegant appearance of oceanic dive computers, their main competitor. Given their rock solid reputation many of our team members swear by their Sunnto dive computer and we are hard pressed to disagree with them. Suunto’s line up is perfect for beginner or experienced divers, as many support both Air and Nitrox function. The Suunto Zoop is a great entry level dive computer that has served many a beginner well when they are looking for their first wrist computer. It is also available in a gauge model and supports both air and nitrox diving. A very reliable dive computer with a large face that makes it easy to read under water. 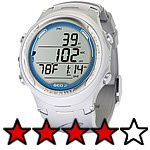 Check out our full Suunto Zoop dive computer review for more details. Suunto recently updated its D4i dive computer design and released the Novo. Similar to the original but available in a range of colors and now with a softer silicone strap. Compatible with the optional Suunto wireless air transmitter if you so choose and a very well laid out, dot matrix display. It comes equipped with a free diving mode as well as Nitrox compatibility. The 4 button design makes it a little daunting at first, but after reading the manual and practicing at bit its easy to get around in the settings. 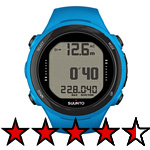 A very durable and long lasting Suunto dive computer that we can heartily recommend. Read the full review. Cressi dive computers are some of the most popular entry level – mid range wrist computers on the market. They tend to be competitively priced and extremely durable. There is a reason we gave the Leonardo the best dive computer review of 2018, it simply outshines the competition in every turn. Cressi has been around since 1946 and create a wide range of high quality water sports gear, with a strong focus on scuba diving and snorkeling equipment. While they might not compete at the extreme high end level as Oceanic dive computers, the market they have chosen to focus on they serve very well. These are some of the cheaper dive computers on the market you can find without sacrificing the quality level you would expect. When we first got out hands on the Cressi Leonadrd wrist computer we were not sure what to expect. At first glance it seems like your run of the mill dive computer. We were pleasantly surprised, so much so we decided to give it our Editor’s Choice award. The simple one button design makes it extremely easy to use and ideal for those who just want to hop overboard and dive. 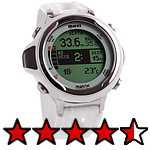 It supports Nitrox diving as well and has a great internal dive log. This is a fantastic computer for any new diver looking to get their first personal dive computer. Read our full Cressi Leonardo dive computer review. 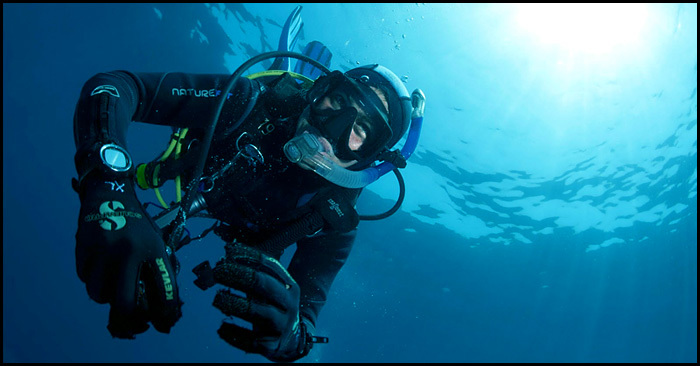 Mares has been making Scuba gear since the late 40’s when they specialized in masks and spearfishing equipment. Today they make a broad range of dive gear and are considered one of the big names when it comes to dive computers. The provide entry level to high end wrist computers starting with the basic Mares Puck, one of the most recognizable dive computers on the market, to the Matrix, a full featured high end computer with all the bells and whistles. 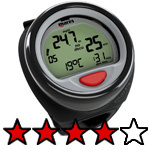 Competitively priced, Mares dive computers are one of the fan favorites in the industry. You will find some unique innovations in their dive computers that most companies have yet to adopt. Like the handy ICE (In Case of Emergency) funtion on the Mares Matrix, displaying critical insurance, allergy and contact info should the worst happen. The Matrix is one of Mares’ high end wrist computers that features some advanced features like the ICE system mentioned above and a stellar digital compass for underwater navigation. Perfect for anyone leading groups or advanced level diving. There is an optional wireless air transmitter availiable should you want to upgrade later on and it has a rechargeable internal battery which comes in handy. 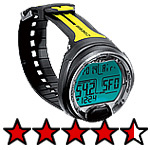 An easy to read display and sharp looking design that works as a daily watch rounds out this all star dive computer package. Check out our full review to discover why the Mares Matrix dive computer is one of our favorites currently on the market. Unless you are completely new to scuba diving, chances are you have seen this iconic wrist computer kicking around most dive shops around the world. The Mares Puck dive computer features a super simple one button design similar to the Cressi Leonardo and is an ultra durable, reliable, true workhorse of a dive computer. Due to its intense maximum depth, many Tec-Rec divers use this as a backup in conjunction with a more advanced computer due to its simplistic reliability. It also features the ability to be reset after any dive, which can make it an ideal choice for dive shops and rentals. A cheap dive computer, but in this case cheap does not mean low quality. Perfect for those on a budget or beginners looking for their first dive computer at a bargain price. Read our Full Mares Puck Dive Computer Review. Shearwater Research is a little different than some of the other dive computer and scuba gear companies out there. They focus strictly on producing high quality dive computers that are extremely versatile and great for tecnical divers. Based in Canada, they only have a few models on the market right now, their priority on putting out top of the line dive computers instead of trying to flood the market with something for everyone. These are some of the best dive computers in the world, great for intermediate and advanced level scuba divers. The Petrel 2 is an amazing top of the line dive computer that surprisingly won’t break the bank. With options for Air, Nitrox and Trimix, this wrist computer is perfect for those interested in getting into technical diving, or intermediate to advanced divers who want a full featured dive computer. With an amazing built in digital compass and super crisp LCD display screen it is definitely one of the more high tech dive computers on the market. Read our Full Shearwater Petrel 2 Dive Computer Review. Why Use a Dive Computer? As you dive, breathing compressed Air/Nitrox/Trimix allows concentrated levels of Nitrogen to dissolve into your bloodstream. The longer and deeper you dive, the slower your ascent rate and longer your decompression time will be. Should you Ascend too quickly or skip your safety stop, there is a risk of Nitrogen bubbles forming in your bloodstream and expanding, causing decompression sickness (dcs) aka “The Bends“. DCS can be extremely painful or even fatal in some cases if not treated quickly. The older method of using dive tables is still useful for planning your dives, but modern technology allows you to get a far more accurate picture of whats going on inside your body and increase dive safety via the use of dive computers. A dive computer takes depth and time information and applies it to a decompression model to track the dissolved nitrogen in your body tissue during a dive. Your computer continuously tells you how much dive time you safely have remaining. Your computer combines a depth gauge, timer and sometimes a submersible pressure gauge (SPG) into a single, useful instrument. This is immensely useful when it comes to avoiding decompression sickness. No one wants to spend tens of thousands of dollars and hours in a decompression chamber if possible, and using a high quality dive computer is an easy way to help avoid that. Enriched air compatible – Most modern dive computers are equipped with a Nitrox option should you decide to dive with EAN. Air integration. This is great for quickly referencing how much air is left in your tank. Certain models connect via a hose to your regulator. Others can receive air supply information from a wireless transmitter on the regulator first stage. Multiple gas computers for technical diving or some tec diving computers have a CCR (Closed-Circuit Rebreather) mode. Interface with your laptop/regular computer so you can download your dive data. Electronic compass or built-in thermometer. Ask yourself – What type of diving do I do now and plan to do in the future? and What dive computer works with my current equipment, or what complete equipment package includes the type of computer I want? Can you clearly read the data with your mask on? Does the data display make sense to you – do you prefer numbers, or do you like graphics or charts? Do you understand how to get the dive information you need? Don’t hesitate investing in a good dive computer. Choosing the right dive computer for your needs can last you a lifetime of diving on this amazing planet of ours. Used Dive Computers: Are They Worth It? This is a question people seem to ask all the time. Is it a good idea to buy a used dive computer? Each diver has their own thoughts on the matter, but generally we do not recommend it. A dive computer can be a delicate piece of (expensive) equipment, and unless you know the diver you are buying it from well and trust them, its probably not a good idea. You have no way of knowing the service record on that particular computer. It is important to get your dive computer serviced once a year at an authorized dive center, but many divers do not. Also, most manufacturers offer atleast a 1 year warranty, with Oceanic offering lifetime warranties on their products as long as you get a yearly service in. For a piece of equipment you rely on to avoid decompression sickness and thousands of dollars worth of time in a decompression chamber, saving a few bucks and getting a used computer you have no idea the history of use and abuse it has been through just isn’t a good idea. Fins, masks, wetsuits, tanks, if you can find a good deal used go for it! With pieces of equipment that your life depends on like regulators, BCD’s and dive computers, we always recommend buying new. Thanks for checking out our dive computer reviews and hope they help you make an informed decision on the model that is right for you. Check back often as we add more reviews each time we get hands on time with a new model. Happy travels!